All the gift guides spilling over in my Google Reader are making me feel dizzy so rather than copy the trend I thought it'd be fun to do a retro toy gift guide and share some favorites for those us who grew up in the 80s and 90s. I remember getting the JC Penney Christmas catalog (does that even still exist?) and drooling over it, dog-earing pages for things I knew I wasn't going to get. Nowadays are kids on Pinterest making their wishlists? Who knows. Anyway, here we go . . . I think the oversized eyes are what made Pound Puppies so endearing. We had a family dog but I loved my Pound Puppy more (I think because it didn't try to knock me down when I was learning to walk O_o). I remember having a big puppy and a few little puppies. I guess that would be a dog and puppies, but that's just being technical! There was a TV show too which was a favorite of mine as well. Those puppies always needed rescuing! Cheri-Anabel Sloan - that was my Cabbage Patch doll's name and I adored her! I only had one official Cabbage Patch doll, and I think a well-meaning family member gave me an off-brand one - the nerve! I didn't treat it the same as Cheri-Anabel, but would feel sorry for her occasionally and bring her out to play. I was a bit of a toy snob I guess! I heard earlier this year that they brought these back - did you hear about that too? Oh my! Just the sight of this reminds me of how much of a nerd I was. I don't think I knew any other kid that had this but I was obsessed with it. I had the Domino Rally that glowed in the dark although now that I think back I never used it in the dark! This toy required so much patience for a child and I would often give up and just go ahead and knock them down. There were sooooo many pieces! Now I would never let my Lil Love Bird have such a toy - how my mom dealt I have no idea! 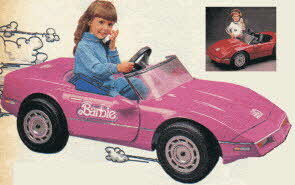 Finally, this was a toy I coveted so badly but sadly never received (and no I wasn't jealous when my sister nearly 8 years younger than I got one when she was a preschooler) - the Barbie Power Wheels Corvette. I was slightly older than my next door neighbor and she would oblige my tantrums requests to ride on the back thus creating so much drag I can still hear the motor struggling down the sidewalk to this day. Did you have any of these toys? What were the toys you coveted in the 80s and 90s?